In a parallel to today's anti-Muslim sentiments, The Menace newspaper was widely popular as it proclaimed the danger of Roman Catholics. The year was 1915, and the strange new newspaper in Aurora, Missouri, had grown so quickly in its first four years that rail officials had to build extra tracks for all the paper and printing materials suddenly rolling into town. The Aurora post office, according to one account, more than tripled its staff to handle mail to and from the publication’s astonishing 1.5 million weekly subscribers – a circulation that dwarfed the largest daily newspapers in New York and Chicago. America’s deep and widespread skepticism of Catholics is a faint memory in today’s post-Sept. 11 world. But as some conservative politicians call for limits on Muslim immigration and raise questions about whether Muslims are more loyal to Islamic law than American law, the story of Aurora’s long-ago newspaper is a reminder of a long history of American religious intolerance. 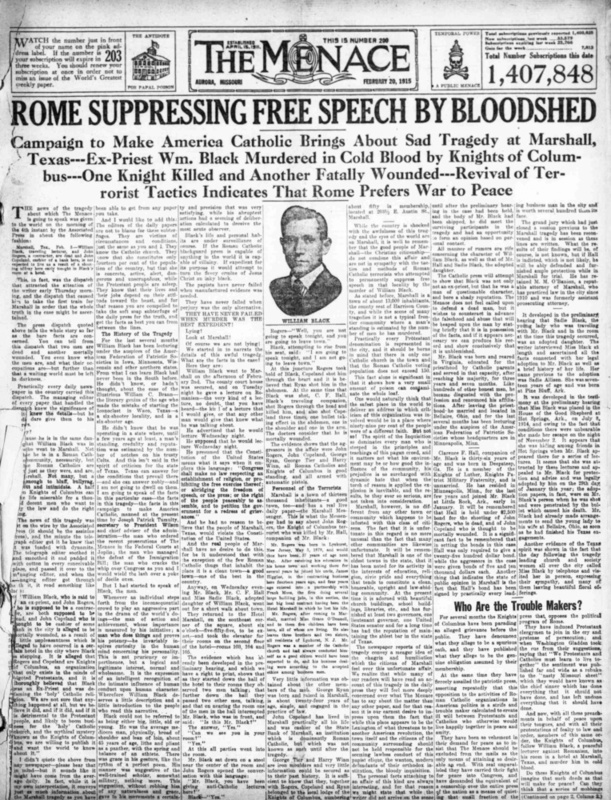 “OPEN ROME’S PRISON HOUSES IN AMERICA!” blared one headline on a December 1911 story that claimed the church was murdering the babies of nuns and throwing the infant corpses into a pit. “There was a widespread belief that Catholics were waiting for the day the pope would put into motion a campaign to make the country Catholic, and in the meantime amassing (stockpiles) of weaponry that would be used when that day came,” Davies said. “It was a black page in Aurora’s past,” said Mary Strickrodt, president of Aurora’s historical society. Rick Hinshaw, a spokesman for the Catholic League for Religious and Civil Rights, said the group’s biggest concerns today are anti-Catholic depictions on TV and in movies and the federal government’s health care mandates.